Dave Thompson, member of Surf Life Saving Australia and Chair of the ILS Sport Commission became Knight in the Order of Lifesaving in 2015. He received his award at a special celebration organised for him during the ILS Gala Dinner on 5th September, at the occasion of the ILS Elective General Assembly and Lifesaving World Championships in the Netherlands. Dave Thompson was a Member of the ILS Sport Commission from 2004 to 2008 and became Chair of the ILS Sport Commission from 2008 to 2016. 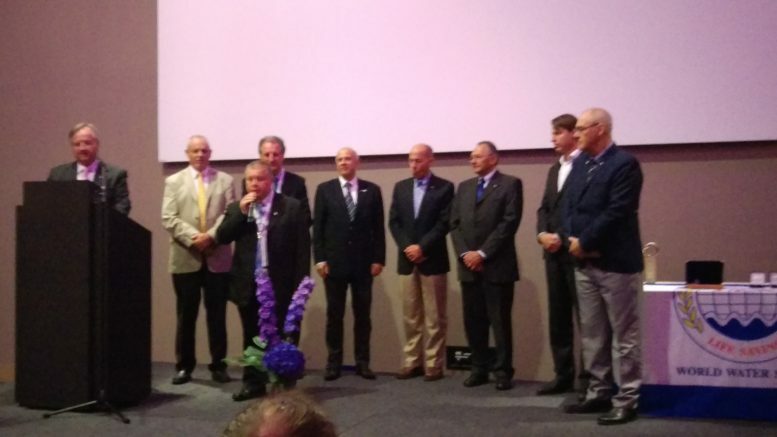 In The Netherlands he was re-elected Chair of the Sport Commission for the 2016-2020 period. Dave Thompson was instrumental in the organisation of the Lifesaving World Championships in Geelong and Lorne in 2006, in Adelaide in 2012 and sits in the Organising Committee of the 2018 Lifesaving World Championships. He lifted the Lifesaving Sports to higher levels. As the Chair of the Sports Commission he was a pioneer in the introduction of the Youth in the Lifesaving World Championships.